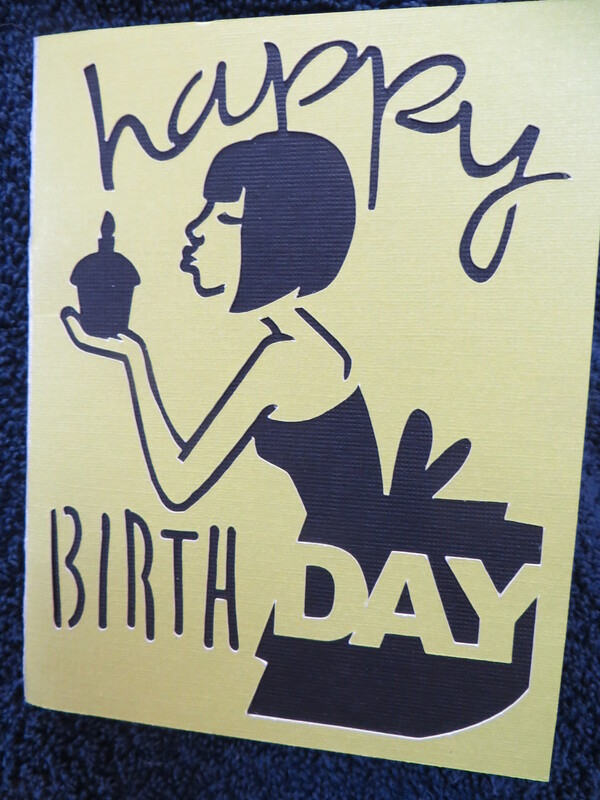 Well today marks the end of my birth month (and also the end of Stampin Up’s sale-a-bration). I am truly blessed by all the family and friends that send cards (store bought and handmade), brewed beer for me, baked goods, mailed packages, gift cards, wrapped pretty gifts, took me to breakfast, lunch, dinner and drinks and over all spoiled me during my birthmonth. With all the surprises that is why I need a month to take it all in! Thanks for everything and all the birthday wishes but most of all for the friendship and love we share. 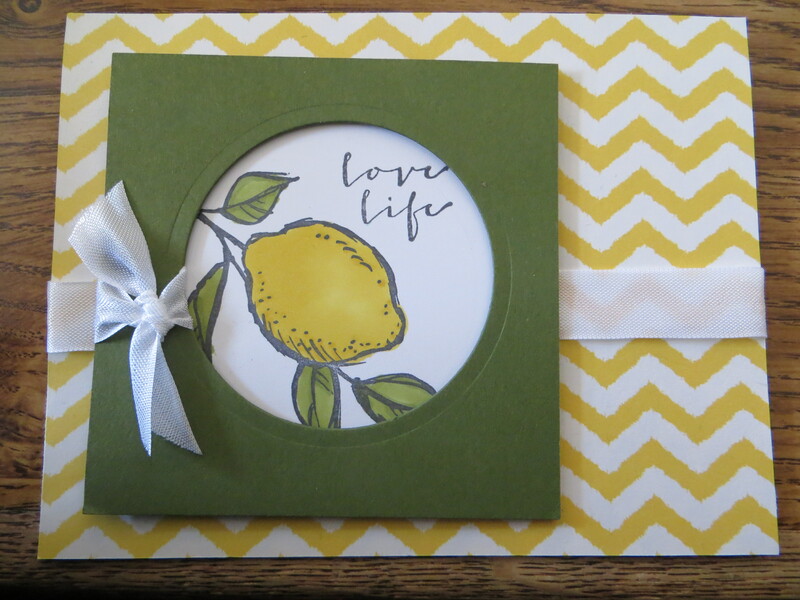 I am a firm believer in the adage when live gives you lemons… ….make lemonade so that is why I must love this lemon image from the free A Happy Thing #139134 stamp set available in the Stampin Up Sale-a-bration Catalog. Sale-abration runs through March 31st so you have thru tomorrow to take advantage of the free stuff for every $50 spent and you can love life too! Birth month is winding down and so is the Stampin Up Sale-a-bration annual campaign. During sale-a-bration, you earn free products for every $50 spent in regular merchandise form the Stampin Up annual catalog and the Stampin Up Occasions Catalog. 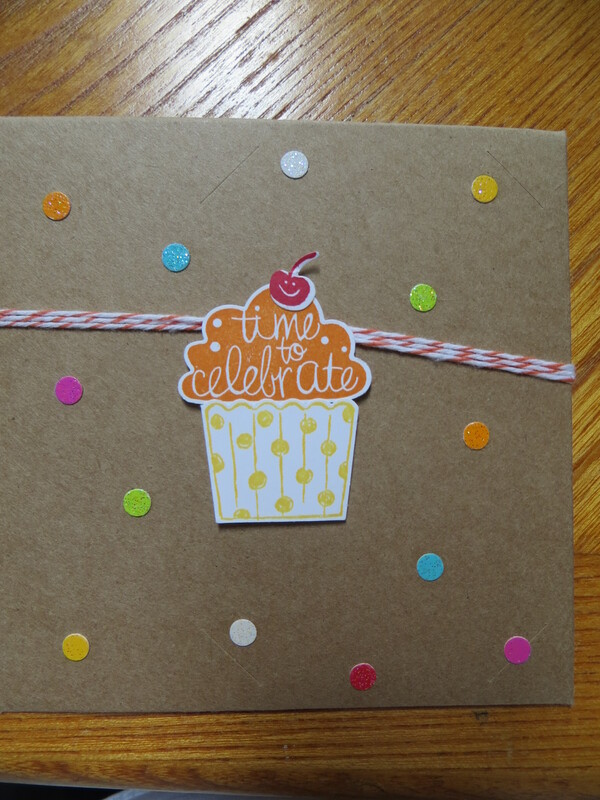 Today’s post features 2 items free items: the Best Year Ever DSP #138633 and the Best Day Ever #139094 stampset. 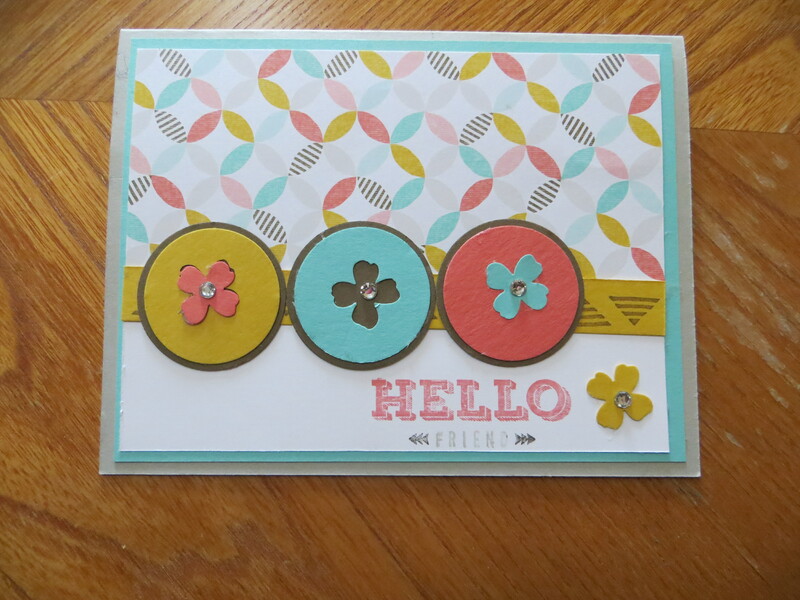 I added 3 punched circles and coordinating flowers to complete the birthday card for an old friend! Yee Haw it is still birthmonth and today so dust off those boots, shine up your spurs, and figure out where you left your ten-gallon hat because with the 25-piece Yee-Haw photopolymer stamp set you can really let your cowboy (or girl) flag fly! 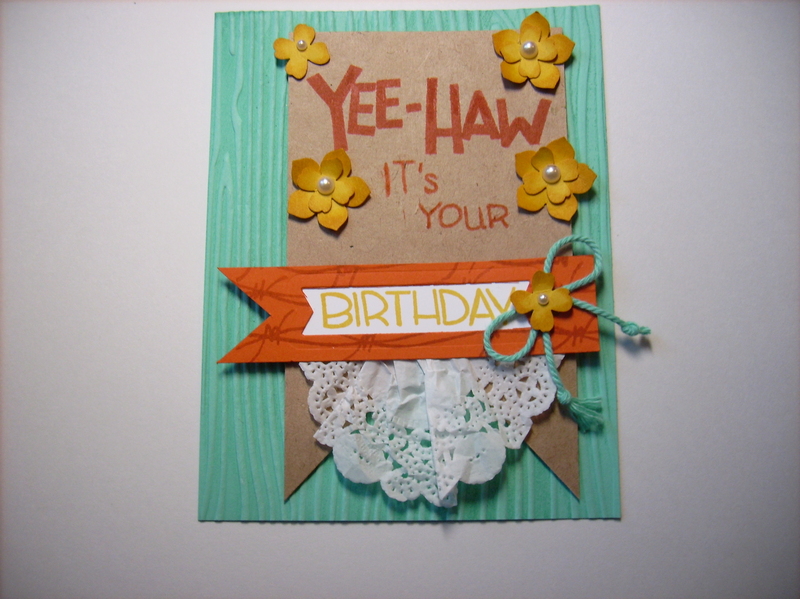 I am featuring a card that Cammie made using the Yee-Haw photopolymer stampset #138107 and would bring out the cow girl in anyone who receives this card. 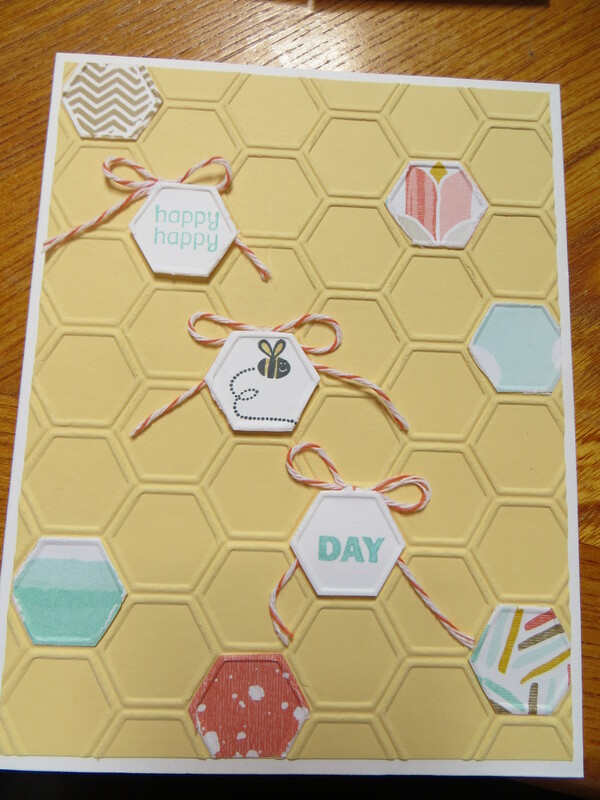 Continuing with the birth month posts, today I am featuring a super fun card using products in the Stampin Up occasions catalog. 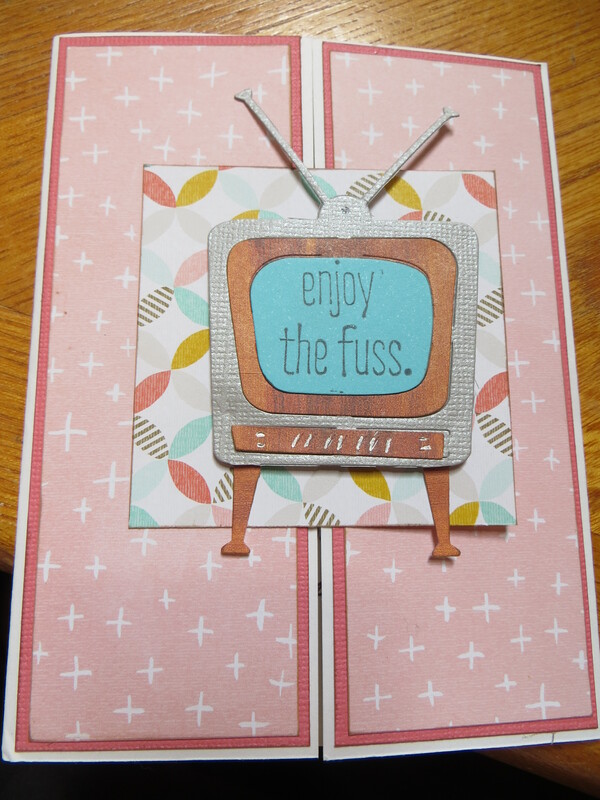 I started with a whisper white card front and added a strip of the Birthday Bash Specialty Designer Series Paper # 137783. 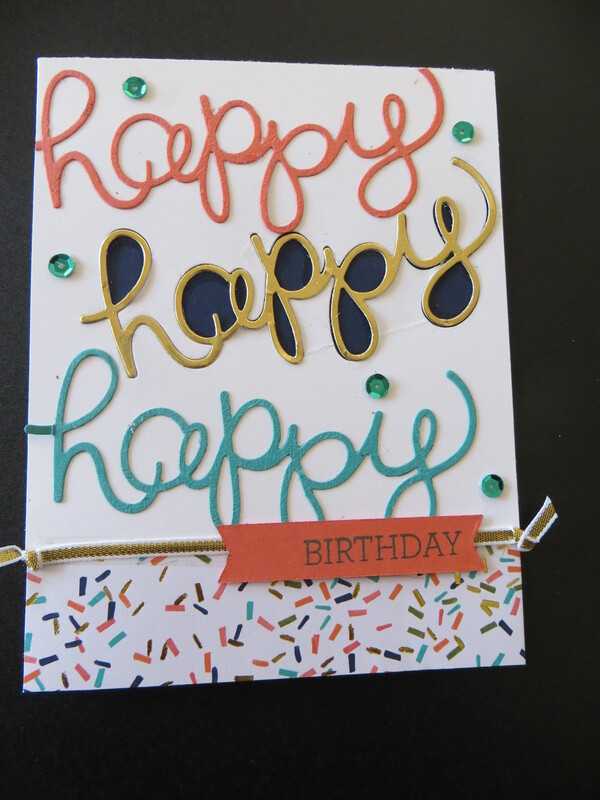 I then cut out a happy using the Hello You Thinlits Dies #137363 to reveal the navy mat through the letter openings. 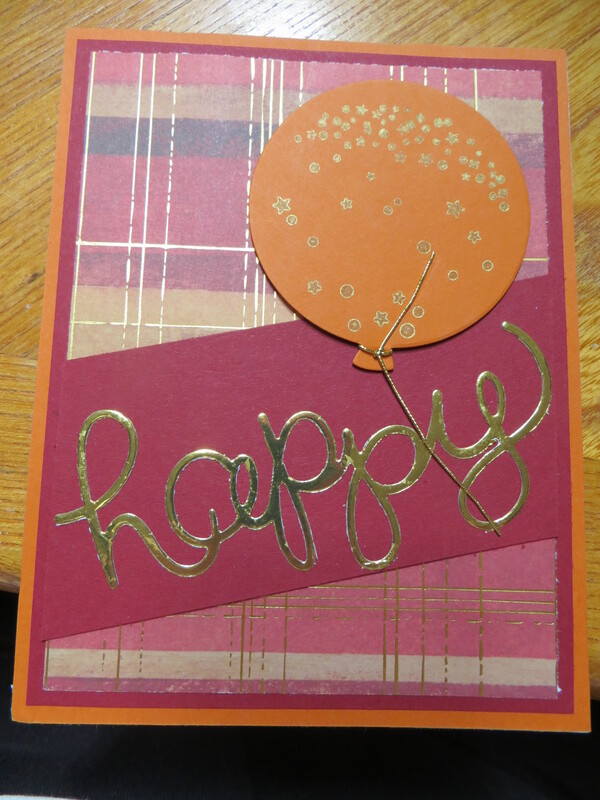 I then cut 3 more happy words in coordinating colors and added them to the card front. 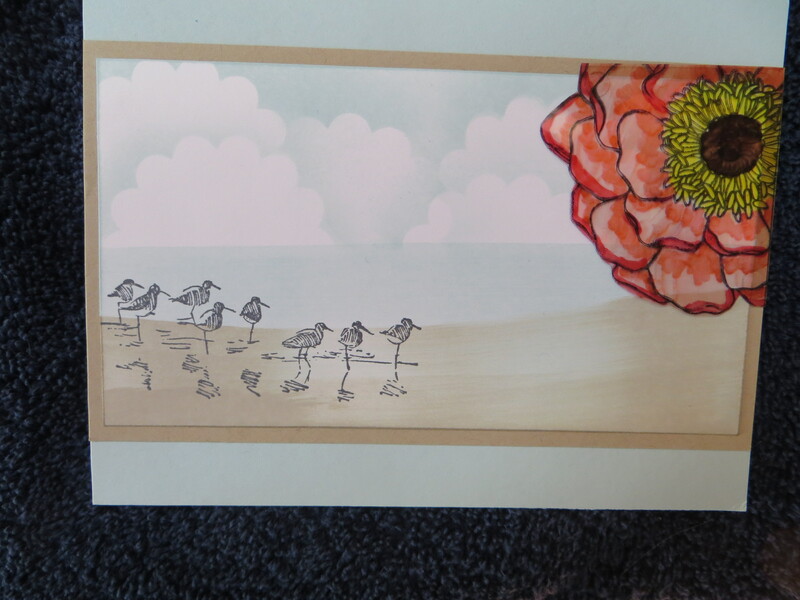 I cut a Calypso Coral Banner and stamped the birthday sentiment from the Crazy about You #137137 stampset. I added a piece of 1/8 inch gold taffeta ribbon and a few Bermuda Bay sequins left over from a My Paper Pumpkin kit. The Hello You Thinlits and the Crazy About You stampset are a Bundle and Save item in the Stampin Up Occasions Catalog. When purchased together (wood #139324, Clear #139325 and Photopolymer #138873) you can save 15%. Remember any purchases made through the end of March you will earn free products from the Stampin Up Sale-a-bration campaign. Hurry ’cause time is running out. The A Happy Thing stamp set #139134 is one of the free stamp sets in the Stampin Up sale-a-bration catalog and is the set plan on using to make gift sets of cards for some family and friends. 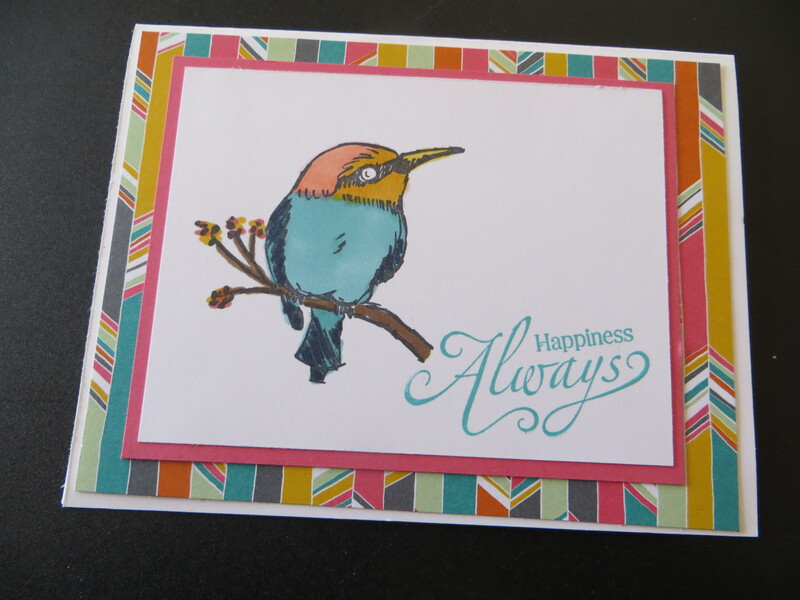 Today’s card is a simple design using the Confetti Celebration DSP #133692 and then used the coordinating Stampin Up Blendabilities to color in the Happy Thing bird. The A Happy Thing stamp set is one of the many free items that is available only during Sale-a-bration and is available in wood #139091, clear #139094 and Photopolymer #139149. To see the other free items check out the Sale-a-bration catalog or the newly added SAB item supplement list from now through March 31st. You can earn free products throughout the Stampin Up annual Sale-a-bration campaign. You can select 1 free product for every $50 (before tax and shipping) spent. Stock Up now because the campaign ends on March 31st.